“Wolfshead” was the fourth and final Robin Hood film to be associated with the Hammer company, more famous for their horror movies of the 1960s. However, it’s production history is not so simple. 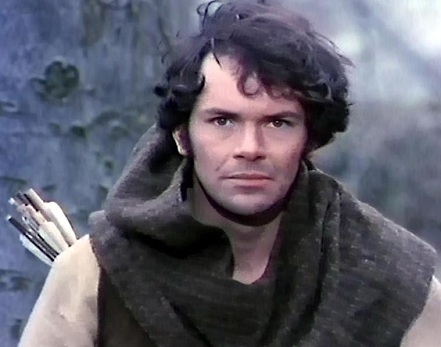 This very gritty version of the Robin Hood story was initially produced by London Weekend Television, intended as a pilot for a subsequent series. But when the television company decided against taking up that option, Hammer purchased the pilot, subsequently circulating it under their name and copyright. This explains why the film is featured in the “Costumes” episode of the 1990 “World of Hammer” documentary. (Copies sold today on internet auction sites usually come from a later TV source in which the original title was blacked out in favour of a rather crude graphic reading “The Legend of Young Robin Hood”). “Wolfshead” was the first contemporary telling of the story of Robin Hood. Filmed entirely out on location in North Wales, it’s characters struggle for existence across a bleak, windswept, winter landscape. All thoughts of Merry Men in Lincoln Green are dispensed with in favour of an attempt to portray with greater realism the conflict between the Saxon farmers and the Norman baron’s intent on seizing their properties. The story: Robert of Loxley, a simple farmer, is working his land with friend Much, when a fellow Saxon runs through their property attempting to escape Sir Jeffrey and the Royal Game Warden. Robert denies seeing the alleged poacher, and (in time honoured tradition), the fight which ensues is destined to seal his fate. When Sir Jeffrey’s brother, Roger of Doncaster, learns that Robert of Loxley was not killed for his insolence, he determines to use the incident to have him arrested and his lands confiscated. Sir Roger’s ulterior motive is that his intended bride Lady Marian Fitzwater, has a crush on Robert from childhood, and this stands in the way of his marriage to her. So he enlists the help of the Abbott to have Robert made a Wolfshead: An outlaw who’s head is worth that of a wolf’s, dead or alive. “Wolfshead” is the start of the story of Robin Hood, and leaves us just as the Legend is about to begin. Sadly, the subsequent TV series was never made. This pilot was just too far ahead of it’s time. Maybe it still is. But this grim telling of the tale, with it’s clear attempts at authentic references, is highly recommended to Robin Hood fans who find the sequins on Errol Flynn’s green costume a little hard to take. Special mention should be made not just of Director John Hough, but of Director of Photography David Holmes, who’s camera angles are a visual feast. More about Hammer Films dark visions of Robin Hood can be seen on THIS LINK, THIS LINK, and THIS LINK. 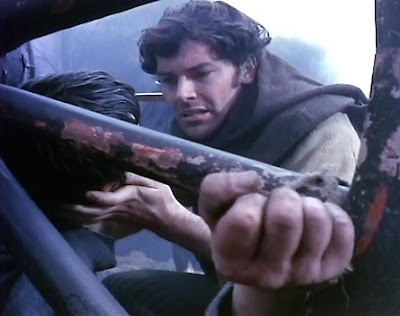 Also, if you like the mystical aspects of Robin Hood, you might enjoy "Beyond Sherwood Forest". Robin of Sherwood : The Jason Connery series. Robin Hood, the Green Man. Robin Hood (1991) film review.